JC, my eleven-year-old, had a noun test today in his Language Arts class. He had to be able to identify different types of nouns: subjects, subject compliments, direct objects, indirect objects, and objects of a preposition. Let me tell you, Blogtropolis. I write for a living and I couldn’t identify these nouns if my life depended on it . . . until Sunday when I had to learn them for Fifth Grade. JC loves to write and tells a great story, but he wasn’t keen on spending his weekend learning his noun types. Subjects he had no problem with. Subject compliments were another story. Subject compliments follow a linking verb (is, are, was, were) and describe, or compliment, the subject. The subject compliment = the subject. We tried some examples. The lizard is an animal. Go on! You try! Label the nouns . . . *Jeopardy theme plays* . . . The answer? Lizard is the subject, with is as the linking verb, and animal the subject compliment. Animal = Lizard. Good job! His sentence: You are really exhausting. Me (a.k.a. the “princess,” according to my sample sentence- I need to have my fun, too): That’s fresh! I’m exhausting? Do you think I want to spend my day studying nouns? I passed fifth grade a long time ago. And by the way, “exhausting” isn’t even a noun. JC: Well, I don’t want to study nouns either. And “exhausting” IS a noun. Me: It’s not a person, place or thing. It’s a describing word. JC: It’s a thing, and you’re it. His sentence: You are so rude. 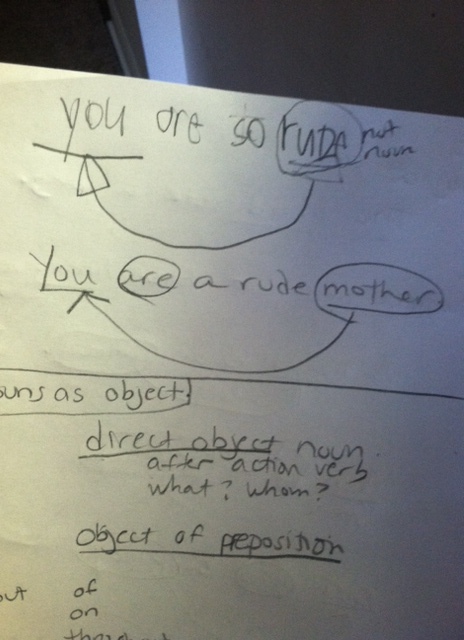 My correction: You are a rude mother. Hey, you know what they say. If you can’t beat ’em . . .
Subject compliments were conquered by the end of our study session and JC and I made up. Direct objects and indirect objects were difficult. Objects of prepositions were impossible, since JC doesn’t know his prepositions. Finally, when I needed a break and some coffee (I swear, studying with JC was like pulling an all-nighter in college- I was tempted to go to the 7-11 with a handful of quarters for a Super Big Gulp and some Vivarin, circa 1990), I stuck him in front of YouTube to watch videos of very nice people explaining this stuff way better than I. 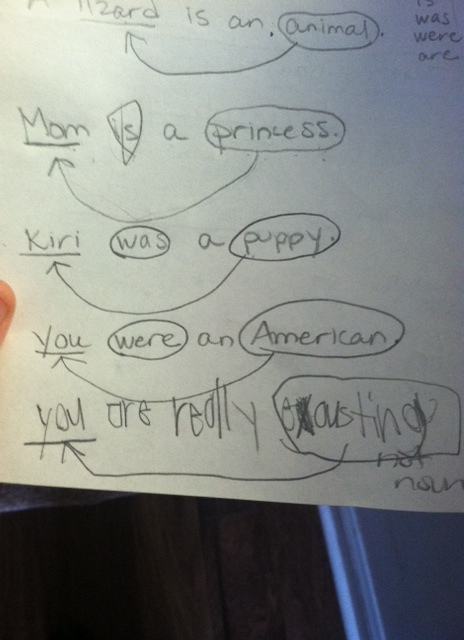 Nice try to teach noun and pronoun at once by linking both in one sentence. Students understand better with such examples. Carry on!